If you ever doubt that a wedding, whether a religious celebration of the sacrament of Matrimony is still relevant, then you only need to watch the highlights of this wedding. It is fair to say that Dimitri and Bobbie have not had the easiest of times and that they have had to face circumstances that other couples are lucky never to endure. As strong as their love is, these newlyweds know that family is crucial to the success of any marriage, and nothing shows the importance of family better than a Greek wedding. From the Stolisma, which involves the family and friends of the bride and groom helping them dress and prepare for the wedding, to the ceremony itself and the group dancing at the reception, the involvement of family is symbolic of the love and support on which the couple can rely. 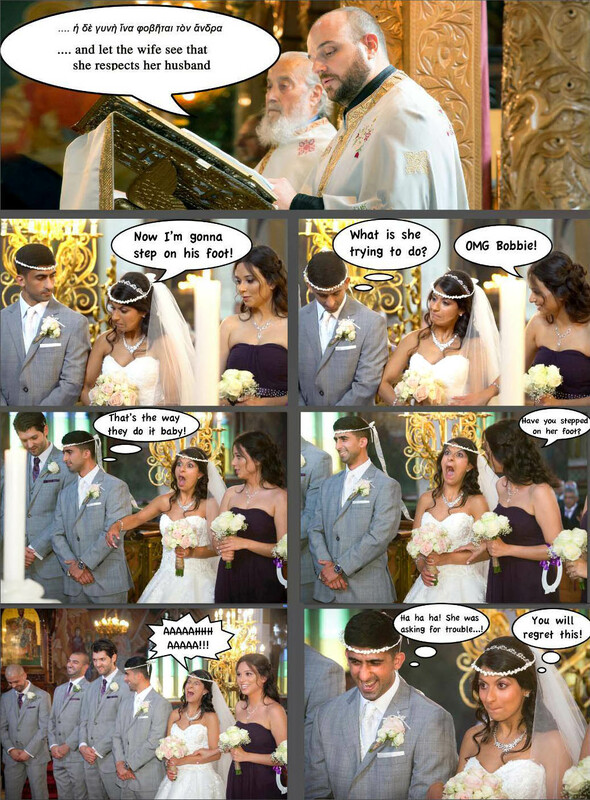 The wedding was at St John the Baptist Greek Orthodox Church in North London. There are around two dozen Greek Orthodox churches in the capital, with this being one of the largest communities. The ceremony was beautiful, with all of the typical customs would expect including the blessing of the rings, the wearing of the wedding crowns which symbolise the uniting of two people and two families, and walking around the altar three times to represent the lifelong journey on which the couple is embarking. The best man and maid of honour (koumbaro and koumbara) are expected to be godparents to the couple’s first child, so they are always very close friends of the couple. After the service, everyone decamped to Orsett Hall, around 40 minutes from London. Dimitri loves cars and relished the opportunity to take his classic 1970s BMW. The grounds of Orsett Hall are ideal for wedding photography and videography in Essex, and we had fun using a quadcopter for some aerial videography. The evening event was everything you would expect from a Greek Cypriot wedding reception, including plenty of music and dancing. The bride and groom entered the venue accompanied by a violinist playing a traditional melody and later participated in the money dance, and there were lots of other recognisable tunes that had everyone dancing until it was time to leave. Highlights this wedding included the groom’s touching speech which brought tears to the eyes of not only his bride, but also of his new father-in-law, the gorgeous vintage cars used for transportation, and the strong sense that whatever life throws at this couple, they will emerge stronger and more united than ever. There was a funny moment when Bobbie tried to step on Dimitri’s foot. When the changer reads the line “the wife should respect her husband” the bride will sometimes try to tread on her groom’s foot light-heartedly. However, Dimitri was too quick, and it was Bobbie’s foot that was stepped on!